RP Innovations SG is proud to present this two days preparatory course on Flying of Unmanned Aerial Vehicle (UAV) for Commercial Purposes. This workshop will cover the overview of Aviation Safety, Air Law (Local), Airworthness for Aircraft, Operational Planning, Communications, Meteorology, Navigation, Flight Operations and application procedures for Civil Aviation Authority of Singapore (CAAS) Unmanned Aircraft Systems Permits. In addition, participants will learn and demonstrate basic and advanced flight maneuvers during the hands-on session on the second day. Practical competency assessment will also be conducted. 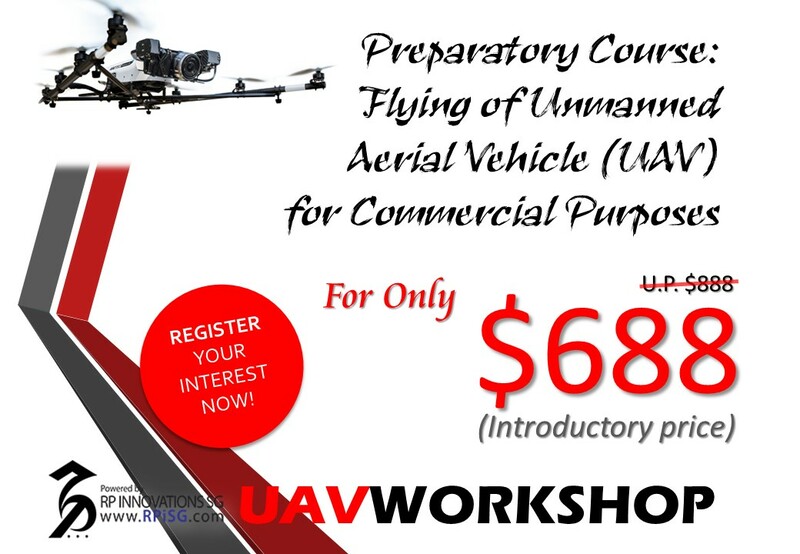 Disclaimer Clause: The completion of this course does not constitute or guarantee any successful application for CAAS Unmanned Aircraft Systems Permits.